Anti-microbial touchpad surface and surrounding surfaces are manufactured and tested to protect against cross-contamination of germs within the workplace. This keeps your point of use water purification system clean and your employees healthy. At the core of PHSI’s patented technology is a microprocessor that controls and monitors activated oxygen injection, filter life, water quality, and all other system functions 24 hours a day. Only the 3i water purification system can deliver this level of programmability and performance that keeps your water fresh and pure. ATS eliminates microbiological contamination and does away with the tedious and often overlooked task of sanitizing the holding tank. The ergonomic design delivers an optimum dispense height and spacious dispense area for large containers which prevents germ contamination of the dispense nozzle. Since the 3i is a bottless point of use system, it can fit just about anywhere! During the ATS process, the water is oxygenated delivering FRESHNESS YOU CAN TASTE™. 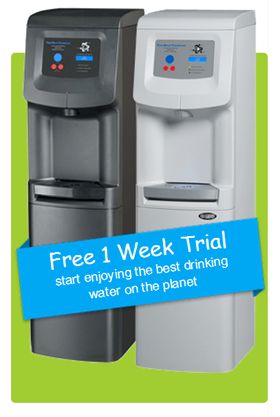 No other bottleless water cooler delivers this level of quality. The cold water dispenses at 37 degrees and will chill a glass for clients wanting that cool fresh glass of water. The hot water dispenses at 198 degrees, great for teas and other hot beverages. Multi-stage process utilizing Sediment Removal, Dual Carbon, Reverse Osmosis (80 gallons per day) and Activated Oxygen Injection. PHSI is a U.S. based manufacturer of water purification coolers and PHSI’s factory is a state of the art ISO 9001 and 14001 facility. Our pure water systems are tested and certified to the highest North American and European standards for safety and performance, including NSF/ANSI 42, 53 & 58, EnergyStar, UL, CE, and WQA Gold Seal. MANUFACTURING, MEDICAL, AND DENTAL INDUSTRIES WTIH DISTILLED WATER.